The Wellington Rotary Club has taken the opportunity to embark on a fundraising campaign that will help the community demonstrate its ability to provide funds for the public portion of the cost to equip a new facility to replace the current PECMH. It is anticipated that the campaign will last through to 2022, at which time we will assess the status of the approval process by the Ministry of Health and Long Term Care. If the approval has been achieved, the funds will be earmarked to equip the new facilities. In the event that there is no replacement facility approved by that time, the funds will be directed to other suitable health care related causes in PEC. 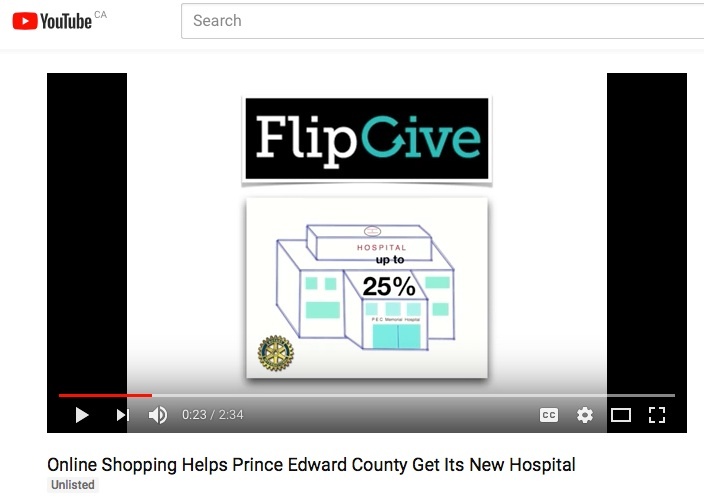 Flipgive is a program that rebates a percentage of sales to the Fundraiser every time you make an online purchase at one of the participating stores, such as Amazon.ca, Walmart.ca, Indigo.ca, etc..
Watch the video on joining the Wellington Rotary FlipGive team in support of the New PEC Hospital Capital Fund.